Time and time again this season, Greencastle-Antrim softball coach Mark DeCarli has been seen pacing the dugout, biting his nails, fidgeting with the brim of his cap - displaying all the signs of a nervous coach. The Blue Devils have been in countless anxiety-ridden situations. G-A pitcher/third baseman Liz Ward said, "It feels like every single one of our games have been like this, and I'm like, 'I'm going to die of a heart attack.'" Currently on a four-game win streak, the Blue Devils have not had a single easy ride during that time. 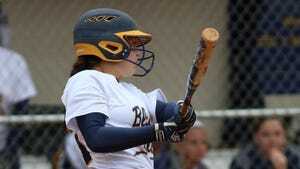 Greencastle started with a win against James Buchanan, scoring two runs in the top of the eighth inning. A walk-off hit by Ally Brown ensured an 11-10 win over Shippensburg. 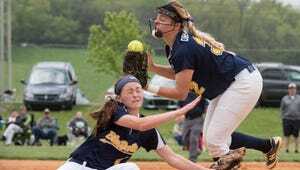 Against the one-loss Chambersburg Trojans, Morgan Wagaman scored on an error in the bottom of the seventh inning. On Tuesday, the Blue Devils led Big Spring just 9-8 heading into the seventh inning, but scored a pair of runs in the top of frame to ensure a win and a share of the Mid Penn Colonial Division crown. "I believe these games do give us an edge," DeCarli said. "Our girls grew from that 20-5 beating we took from Big Spring, and these close games build character. Pulling these close games out show our girls have a lot of heart, and they're ready for anything throw their way." Greencastle has lost just once since falling to Big Spring, and it has a number of other nail-biting victories throughout the season. Alicen Hoover hit a walk-off double to beat Waynesboro; Brown smashed a walk-off home run in an earlier defeat of the Rockets; and Wagaman stole home in the top of the seventh in a 3-2 win over Littlestown. "I think we were definitely ready and mentally prepared," Wagaman said following the win over Chambersburg. "I think these are good games, and I love playing in them. I know they're nerve wracking, but I love it." It certainly should pay off, come the District 3 Class AAA playoffs. The Blue Devils are currently third in the power rankings. "I think it's really going to help us out during districts because we're going to have that edge," Ward said. "A lot of teams aren't going to know what it's like, but we'll come into it having that experience. Some teams will get down and won't know what to do, but we know what to do and we're going to know how to get back."